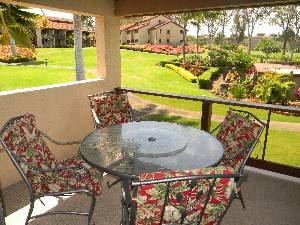 Two bedroom, 2 bath townhouse style condo in the Waikoloa Villas overlooking the 9th Fairway of our beautiful golf course. 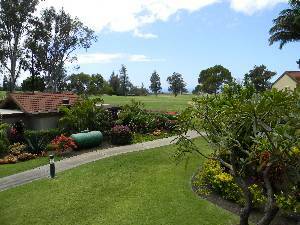 We are just six miles from the world famous Hilton Waikoloa, Mauna Kea and Mauna Lani Resorts and beautiful white sand beaches. 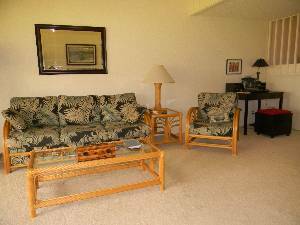 The condo is approximately 1250 square feet and furnished in a tropical motif. There is a king size bed in the master, two queens in the second bedroom and the sofa converts to a queen size bed if needed. The master bath has a large jetted spa tub for your relaxation. The living room features cathedral ceilings and opens to a spacious lanai with wetbar where you will enjoy ocean, sunset and golf course views. The full kitchen is complete with all the cooking ware, paper goods and staples that you will need for meal preparation. 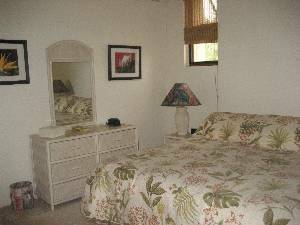 Linens and towels (including beach towels) are provided and there is a washer/dryer in the condo. There is a HDTV, DVD and Radio/CD player. WIRELESS HIGH SPEED INTERNET IS AVAILABLE. The Villas are located along the 9th fairway of an 18-hole Robert Trent Jones Jr. designed golf course. The golf course recently received a four-star rating in the 2009 edition of Golf Digest's "Best Places to Play." Discounted green fees are available to guests of the Villas. There are many other beautiful golf courses near by. This is truly a "golfer's paradise". There are two swimming pool and spa areas within the complex. Well maintained barbeque and kitchen facilities are available in these areas as well. Tennis courts are available at the clubhouse at no cost. Water Aerobics classes are held at the community pool on MWF at 9:00 a.m. These are also available at no cost. 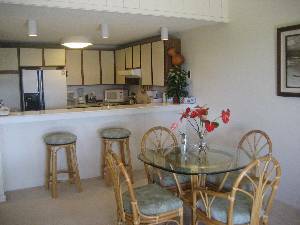 You will be a short stroll from the Waikoloa Village featuring a large grocery store complete with deli, fresh butcher and bakery. You will also find a bank, pharmacy, health food store, and other shops for your convenience. 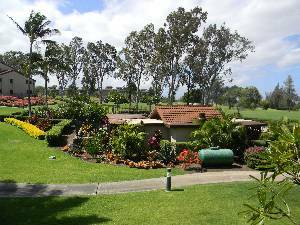 This is a perfect location for those side trips on the Big Island to Waimea (Parker Ranch), driving along the Kohala and Hamakua Coasts, or a day trip to visit the volcano and the Hilo side of the island. There are beautiful beaches, waterfalls and botanical gardens, just to mention a few of the points of interest along the way to all of the above destinations. Shopping is plentiful at the Kings Alley Shopping Center or the new Queens Shops, both located in the Waikoloa Resort area. Luaus, restaurants and other entertainment are also available in the resort areas which are just a short distance from the condo (6 miles). Master Bedroom has walk in closet and separate vanity area. We have just returned from a lovely stay in this condo. The condo was very clean and very well stocked...in the kitchen, all kinds of spices, plastic wrap, tin foil, zip lock bags to name just a few items and a bag of Kona coffee to get us started, shampoo and soap in the bathrooms, lots of towels and extra bedding and oodles of beach toys including, beach towels, beach chairs, umbrella, coolers, beach mats and boogie boards. Saves bringing a lot of things with you. The lani, with it's super nice patio set, where we ate most of our meals, over looks the pool. This in turn made BQ-ing very easy as the BQ'S are situated at the pool. Any problems we encountered (which were few) were handled immediately. Not only was the owner very commodating, but so was her cleaning staff. This condo also has its own wifi connection, another extra not all condos provide. We hope to return to Hawaii in the near future and look forward to staying here again. But the BEST part of this condo is the owner, Susan. A lovely lady to work with and very caring about her guests. 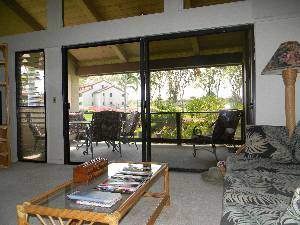 Thank you for sharing your home in paradise with us Susan. Discounts will be considered for extended stays beyond one month. 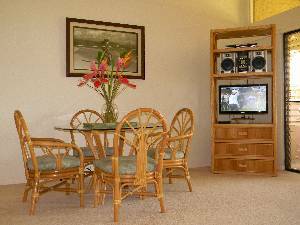 Call or email for senior or Kamaaina discounts Prices listed do not include 13.41% Hawaii Lodging Tax (effective 7/1/2010) Call or email for Holiday rates. Deposit: $300.00 reservation/security deposit required to confirm reservation. Cancellations and Refunds: Final payment due 45 days prior to reservation. Cancellation Policy on request. Other Fees: Cleaning Fee is $100.00 for stays longer than one week.